Rated 95 and #3 Best Cigar of 2015. It�s big. It's blocky. And it has the flattest head ever seen on a premium cigar. It's also loaded with surprisingly rich, complex tobacco. The CAO Flathead V660 Carb is one of the bulkiest cigars in the CAO Flathead line, which is made by General Cigar Co. in Nicaragua. The idea was for the cigars to resemble the engine blocks found in America's classic hot rods, and this is reflected in the packaging as well. Each box looks like an engine and even comes with a vintage-style print of a pinup girl. 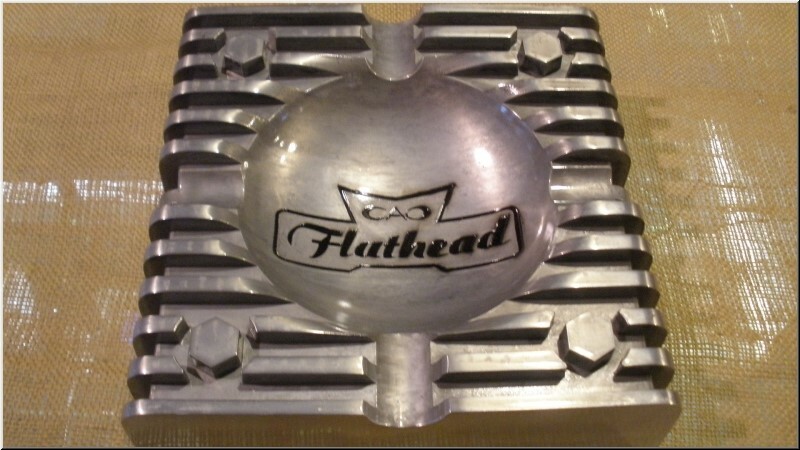 There is undoubtedly a jovial aspect to the theme, but it would be a mistake to dismiss the Flathead as a novelty. The cigar is a gutsy blend that starts with a dark Connecticut broadleaf wrapper, a Cuban-seed binder also grown in Connecticut and a combination of Nicaraguan ligero and Dominican Piloto Cubano tobacco. If creators Rodriguez and McKenna intended the blend to reflect hot rods and muscle cars along with the packaging, we'd say they delivered. The name Carb 660 is named after the carburetor of a combustion engine and 660 indicates the length and ring gauge. From the first light, this seriously squared-off cigar takes off with notes of ripe fruit, leather and molasses that only gain intensity as it smokes. Made of Aluminum. Weighs 2½ pounds 8" square.